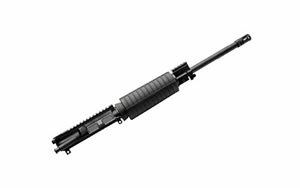 Colt Mfg AR6951CK AR6951 9mm 16"
An upper receiver refers to the front and top section of an AR-style rifle. An AR-15 upper receiver contains about 80% of the rifle’s functionality, including the fore stock, forward assist, charging handle, barrel, gas operating system, bolt and bolt carrier assembly. 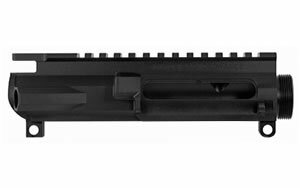 Most upper receivers are MISPEC, meaning you can use them with many different lower receivers, and it allows you to easily transition between barrel lengths, AR-15 parts and calibers. Before you can decide which upper receiver is right for you, it’s good to understand the major components and differences between them. Operating System: One of the key features and major differences between upper receivers is the operating system. There are essentially two operating systems to choose from with AR-15 rifles—direct gas impingement and gas piston technology. The original AR-15 system, designed by Eugene Stoner, was direct gas impingement (DGI). When the trigger is pulled in a DGI gas system, propellant gas is channeled through a small hole in the barrel, then a tube to where it can directly contact (or impinge) the bolt carrier mechanism. The gas is then pushed toward the rear of the rifle, extracting and ejecting the spent case. The gas is then pushed forward by means of spring-loaded action, and it strips a new round from the cartridge, loading it in the chamber to be fired. Gas piston technology was first used by Mikhail Kalashnikov with the AK-47, the AR-15’s first rival. Gas piston technology works similarly to DGI, except that the gas is fed into a separate cylinder within the barrel. Within the cylinder, it forces a piston back that pushes the bolt carrier to extract and eject the spent case, and spring-action (like DGI) pushes it back into position while loading a new round. Barrel: The barrel of your upper receiver is one of the most important components to ensure the best possible shooting experience. Barrels play a key role in accuracy of the rifle. Keep in mind that all barrels must be at least 16 inches in accordance with federal law. Anything less than 16 inches is considered an NFA firearm and will require a tax stamp and additional ATF paperwork. 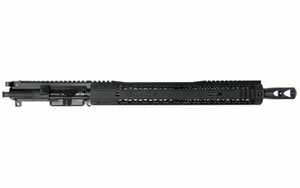 Modern AR-15 upper receivers can be fitted with a variety of barrel lengths, ranging from 14-inch carbine barrels to 24-inch target and long-range barrels. Early AR-15 barrels had a twist rate of 1:12 for the .223 Remington, but most modern AR-15s have a 1:7, 1:8 or 1:9 twist rate. The twist rate of a barrel is designed to stabilize the bullet as it passes through the barrel, and every bullet is designed to function with a specific twist rate, so make sure to match the twist rate of your barrel to the bullet you are using. Bolt Carrier Group: This group of components within the upper receiver is responsible for loading the rifle as well as firing correctly and ejecting spent rounds. It is recommended to purchase a fully intact bolt carrier group with your upper receiver, but if you have more expertise and skill, you can assemble your own, which would include a firing pin, bolt, cam pin, extractor and gas key. Charging Handle: The charging handle allows you to manually pull the bolt carrier group back. There are two reasons for this: One, you use the charging handle to load the first round of a new magazine, and two, if a round doesn’t fire properly, you can use the charging handle to expel the faulty load and replace it. The charging handle otherwise remains stationary during normal firing. Forward Assist: You’ll find yourself rarely using this component of your upper receiver. The forward assist is mostly there to ensure dependability. If your bolt happens to not close all the way, you can push the forward assist to close it. Many riflemen do not find the forward assist necessary on modern upper receivers, but it is always there just in case you need it. 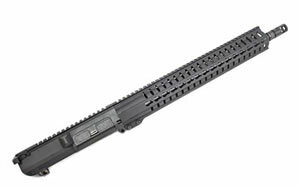 Rail System and Handguard: You’ll find a large number of handguards and rails to further customize your new AR-15 upper receiver. Handguards and rail covers protect your hand from the heat generated in the barrel as you fire your rifle. 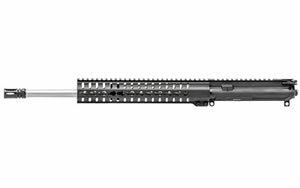 Many modern handguards are referred to as rail systems as they come with more points to attach accessories and further customize your rifle. Rail systems and rail kits are great for customizing your rifle, and the most common rail system is the Picatinny rail. With a rail system on your upper receiver, you can easily attach lasers, flashlights, optics, grips, sights and bi-pods. Ejection Port Cover: The purpose of the ejection port cover is to keep the bolt carrier group and internal components of your upper receiver clean. When firing, the ejection port cover opens through the backward movement of the bolt carrier group. If you want it closed, you’ll have to manually shut it. Keeping the ejection port carrier closed when not using the rifle helps prevent dirt and other debris from getting inside your upper receiver. While browsing AR-15 upper receivers, there are a few variations you’ll run into and want to consider when trying to choose the best AR setup for you. 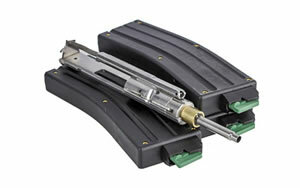 M4 Feed Ramps: The M4 feed ramp is a modification to the standard AR feed ramp. A standard AR feed ramp is a 45-degree cut into the bottom of the breech of the barrel, while the M4 feed ramp is a 52-degree cut that extends all the way to the bottom of the upper receiver. The shallower angle of the M4 feed ramp allows for smoother and more efficient loading and firing of longer, pointier ammunition. 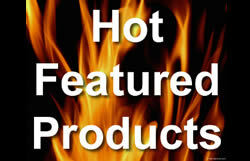 MPI/HPT: While looking at popular upper receivers, you’ll find most saying that they are MPI and HPT tested. To put this in layman’s terms, MPI stands for magnetic particle inspection, and HPT stands for high pressure tested. MPI looks for defaults within the upper receiver that may cause it to malfunction, and HPT ensures the upper receiver and bolt carrier group is able to handle the pressures created when firing high magnitude rounds. 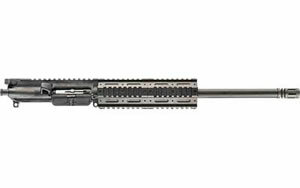 A2 Upper: An A2-style upper receiver is aesthetically more like the original Colt AR-15. It has a fixed handle on the top that incorporates a rear sight that is adjustable for both wind and elevation. 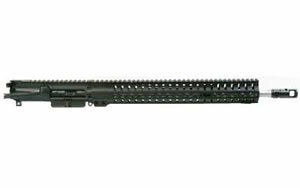 A4 Upper: A4 upper receivers are often called “flat tops” due to their flat upper surface. Unlike the A2 uppers, the flat accessory rail on the A4 allows for a wider variety of attachments, including an A2-style handle. 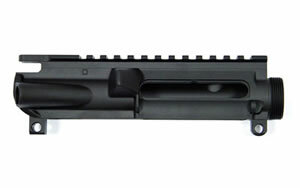 Further, the A4 upper receiver includes an M4 style feed ramps. You will find that most modern AR-15 components come with M4 feed ramps as a standard. Muzzle devices can be added to the muzzle of an AR upper receiver to enhance your shooting experience. Popular muzzle devices include compensators, muzzle brakes and flash hiders. Compensators: Compensators help to prevent muzzle climb and improve accuracy by venting gases from the barrel upward and out. Muzzle Brakes: Muzzle brakes help to reduce recoil by up to 40% and improve accuracy by venting gases horizontally. This further reduces muzzle climb while providing a clear line of vision for follow-up shots. Flash Hiders: When firing, gunpowder combustion produces a flash of light as the bullet leaves the barrel. This muzzle flash can give away your position as well as briefly hinder your line of vision. Flash hiders help to counter these disadvantages. Finally, you’ll want to take a gander at the wide variety of sights and optics available to attach to your upper receiver. From red dot sights to high magnitude scopes, there are many options available to you for your AR-15. Browse our selection of scopes and optics to find the right sight for you. Also, lasers and lights are very common accessories for AR-15s and other modern sporting rifles. They are great for law enforcement, home defense and target practice. 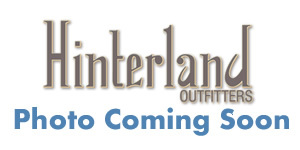 Hinterland Outfitters offers all the best brands for AR-15 upper receivers and AR-15 accessories. Our award-winning customer service team is ready to help you today, so don’t hesitate to contact us with all your questions and needs. 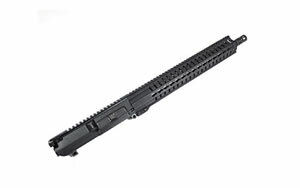 We will help you choose the right upper receiver and build the perfect AR-15 for you.